Imani Rastabi, H., Moarabi, A., Khajeh, A., Kavosi, N. (2017). Management of a bilateral mandibular fracture in a single-humped camel. Veterinary Research Forum, 8(2), 171-174. Hadi Imani Rastabi; Abdolvahed Moarabi; Ahmad Khajeh; Narges Kavosi. 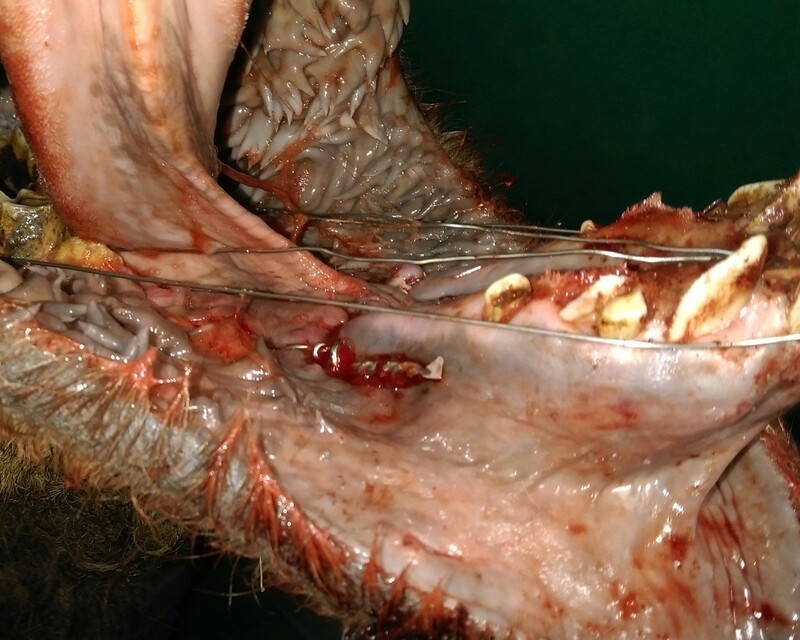 "Management of a bilateral mandibular fracture in a single-humped camel". 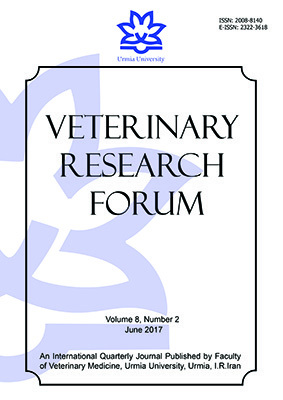 Veterinary Research Forum, 8, 2, 2017, 171-174. Imani Rastabi, H., Moarabi, A., Khajeh, A., Kavosi, N. (2017). 'Management of a bilateral mandibular fracture in a single-humped camel', Veterinary Research Forum, 8(2), pp. 171-174. Imani Rastabi, H., Moarabi, A., Khajeh, A., Kavosi, N. Management of a bilateral mandibular fracture in a single-humped camel. Veterinary Research Forum, 2017; 8(2): 171-174. In the present case report, the comprehensive management of a bilateral mandibular fracture in a single-humped camel including pre-, peri- and post-operative cares is described. A one-year-old camel with the overhanging of the rostral part of the lower jaw which occurred seven days ago was presented. After clinical and radiographic examinations, a bilateral mandibular fracture at the caudal part of canine teeth was diagnosed. It was decided to repair the fracture surgically under general anesthesia. 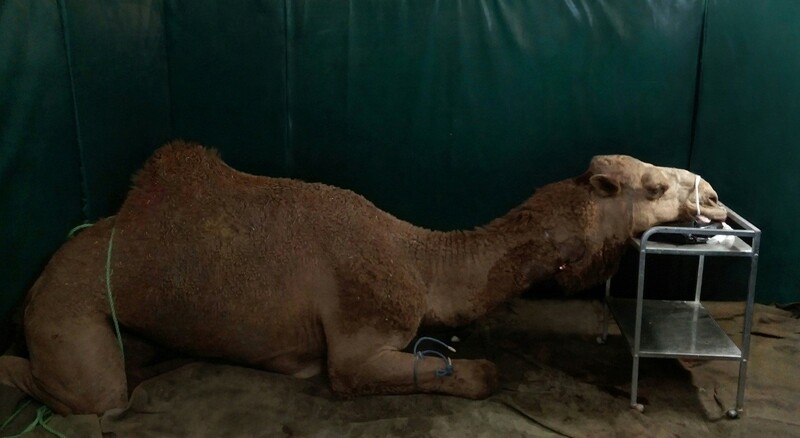 The camel was restrained in sitting position and was remained in this position during anesthesia and surgery period. After premedication with acepromazine (0.10 mg kg-1) and xylazine (0.20 mg kg-1) intramuscularly, anesthesia was induced using ketamine and diazepam intravenously (2.00 and 0.10 mg kg-1, respectively). Maintenance of anesthesia was performed by repeated doses of xylazine and ketamine intravenously (0.10 and 1.00 mg kg-1, respectively) as needed. After preparation of the oral cavity, the fracture was reduced and an interfragmentary wire and an interdental wire (1.00 mm diameter size) were applied on each side of the mandible for the fixation of fracture segments. After two months, the interdental wires were removed while the interfragmentary wires were left intact. Follow up the camel three months after surgery, showed the full ability of prehension and chewing of roughages by the camel. Mandibular fractures are the most common types of fractures in camels which often occur in the rut males following fighting with each other. These fractures are mainly seen across first premolar teeth or at the cranial or caudal part of interdental space.1,2 The presence of mental canal and alveoli of the first premolar teeth and relatively small cross-sectional diameter make this region susceptible to fracture.1-3 Because of high value and effective role of camel in some areas, optimal management and reducing the complications related to these fractures can be important. In the present case report, the management of a bilateral mandibular fracture including history, signs, diagnosis, perioperative care, anesthesia and fixation by concurrent use of interfragmentary and interdental wiring in a single-humped camel is described. A one-year-old male camel with the overhanging of the lower jaw was referred to the Hospital of Faculty of Veterinary Medicine, Shahid Chamran University of Ahvaz, Ahvaz, Iran. Based on the owner’s statement, the camel had been suffered during fighting with another camel seven days ago and the frontal aspect of the lower jaw was deviated ventrally. The animal was not able to grasped foods and had been nourished manually. In the physical examination, bilateral separation of the mandible and lacerations at alveolar and oral gingiva were seen. 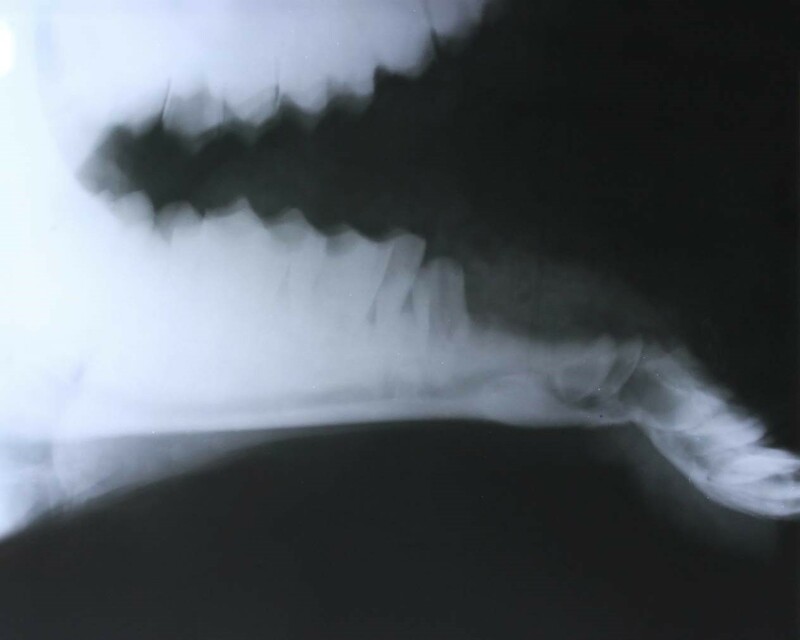 Radiography at lateral views revealed a transverse bilateral mandibular fracture at the caudal part of canine teeth (Fig. 1). It was decided to repair the fractures surgically under general anesthesia. Fig. 1. Transverse mandibular fracture at the caudal part of canine teeth. After about 18 hr fasting, the animal was transferred to the surgery theater, and restrained in sitting position with tightening ropes on the feet (Fig. 2). After acclimatizing to the circumstances, the camel was premedicated with ace-promazine (0.10 mg kg-1, Alfasan, Woerden, The Netherlands) intramuscularly (IM) into the mass of quadriceps muscle. Twenty min later xylazine (0.20 mg kg-1, Alfasan) was administered IM. When the animal was sufficiently sedated, right jugular vein was catheterized using a 14-gauge intravenous (IV) catheter. Anesthesia was induced, 20 min after xylazine administration, with combination of ketamine (2 mg kg-1, Alfasan) and diazepam (0.10 mg kg-1, Caspian Tamin, Rasht, Iran) intravenously. Lidocaine 1.00% with epinephrine (20 mL, Aburaihan, Tehran, Iran) was also infiltrated at the oral and alveolar sides of gingival mucosa. Anesthesia was maintained during the procedure by repeated doses of xylazine and ketamine IV at half doses for induction (0.10 and 1.00 mg kg-1, respectively) as needed. During the anesthesia, the animal was maintained in sitting position, the neck of the camel was stretched and the head was placed on a surgical trolley. Heart and respiratory rates and palpebral and corneal reflexes were checked regularly. Fig. 2. Restraining and maintaining the camel in sitting position for surgery. The oral cavity of the animal was washed with normal saline and diluted povidone iodine solution copiously and the foods, clots and debris were removed. The fracture was reduced and the mandible was maintained in its proper position. Using an electrical drill, two holes were created on either side of the fracture line. Care was taken to avoid dental roots and to maintain proper distance from fracture line. An orthopedic wire (1.00 mm diameter; Aesculap, Melsungen, Germany) was passed through the both holes and was tightened at the lateral side of the mandible. After applying the wires on both sides, the orthopedic wire was passed between the first and second right cheek teeth and central incisors and twisted around the teeth toward the root of incisors at the cranio-lateral side of the mandible. The same procedure was performed at the opposite side (Fig. 3). Fig. 3. Interfragmentary and interdental wiring of the mandibular fracture of the camel. No instability or malocclusion was noted after fixation. After accomplishing the procedure, the oral cavity was washed with normal saline. For more support, a circular bandage was applied around the muzzle. Postoperative radiographic evaluation revealed satisfactory anatomical alignment of the fracture (Fig. 4). The animal was recovered uneventfully and no complications such as regurgitation or delirium were observed during anesthesia and recovery period. Fig. 4. Postoperative radiography of repaired mandibular fracture using orthopedic wire. For postoperative care penicillin-streptomycin (30,000 IU kg-1 penicillin and 10 mg kg-1 streptomycin; Bayer Aflak, Azna, Iran) was administered IM daily for five days. Intramuscular ketoprofen (2 mg kg-1; Razak, Tehran, Iran) was administered for three days. The animal was allowed free access to water but feeding was recommended to be done manually with semisolid foods for at least two weeks. Feeding and drinking, during bandage application, were done by creating a small space between jaws without removing the supporting bandage. Daily washing of oral cavity and confining the animal in a closed area were also advised. 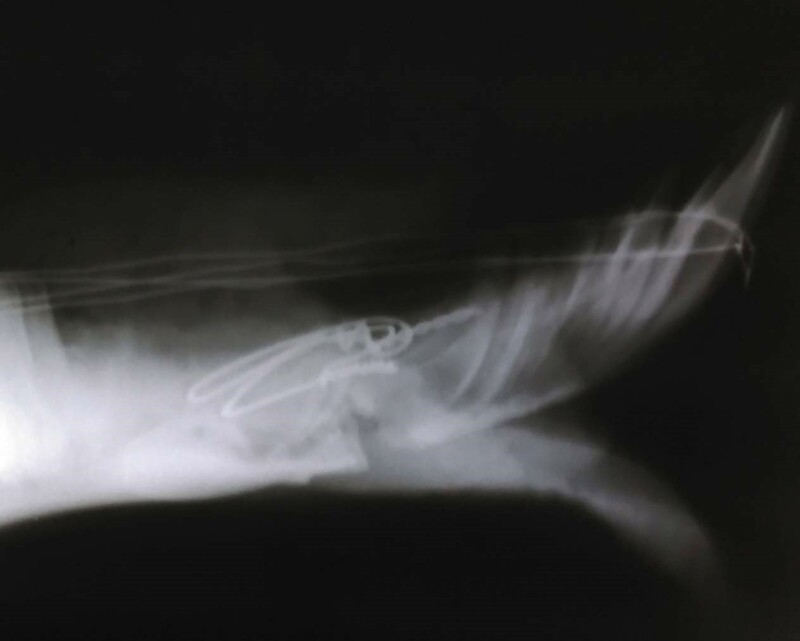 After two months, the animal was sedated with xylazine (0.20 mg kg-1, IM) and interdental wires were removed while interfragmentary wires were left intact. On manual palpation, the fractured segments of the mandible had been tightly fixed, however, a slight ventral deviation of the lower jaw was noticeable. Follow-up the animal three months after surgery showed the full ability of the camel to prehend and to chew roughages. No complication was reported by the owner. This case report described the management of a bilateral mandibular fracture in a single-humped camel with emphasis on anesthesia, fixation method and postoperative care. Although mandibular fractures have been reported in camels, the authors did not find a comprehensive study describing various aspects of an efficient management of these fractures in camels during pre-, peri-, and post-operative care periods. Different methods have been employed for fixation of mandibular fractures in camels including interdental wiring,3,6 U-bar application,7 combination of cross pin fixation and tension band wires,8 bone plating9 and different types of plaster of Paris bandage.3,10 Based on the location, time elapsed to the referral and severity of the fracture, a method or a combination of methods could be used. In the current case, because of some concerns in transporting the animal and providing more stable fixation, the combination of interfragmentary and interdental wiring was used. Applying a circular bandage was performed to support the healing at first days after surgery. Healing of mandibular fracture is relatively rapid and the time for camel’s mandibular fracture has been reported in the range of 7 to 12 weeks.1,7 In the present case, Interdental wires were removed after two months post operation, but interfragmentary wires were left intact. The latter wires were relatively embedded under the oral mucosa and did not annoy the animal. At this time, the fracture site was stable and no movement was seen on manual palpation. Since buried cerclage wires are not removed unless infected,11 the interfragmentary wires were not removed. Siddiqui M, Telfah M, Rashid J, et al. Modified interdental wiring. Technique for mandibular fractures in camels: A clinical study. J Vet Anim Sc 2012; 2: 57-60. Ahmed AF, Al-Sobayil FA. Fractures in young, single-humped camels (Camelus dromedarius). Turk J Vet Anim Sci 2012; 36: 1-8. Lavania J, Municipality AD. A Field Oriented immobilisation technique for mandibular fracture in camel: A clinical study. In Proceeding: The third annual meeting for animal production under arid conditions. Al-Ain, United Arab Emirates 1998; 174-179. Pereira FG, Greene SA, McEwen MM, et al. Analgesia and anesthesia in camelids. Small Rumin Res 2006; 61: 227-233. Lin H. Injectable anesthesia and field anesthesia. In: Lin H, Walz P (Eds). Farm animal anesthesia: Cattle, small ruminants, camelids, and pigs. 1st ed. Pondicherry, India: Wiley Blackwell 2014; 60-94. Hanuman R, Gahlot T, Ram H. Gross and radiological evaluation of RBR IDW technique for repair of mandibular fracture in camels (Camelus dromedarius). J Camel Pract Res 2001; 8: 199-202. Ahmed AF. Mandibular fracture in single‐humped camels. Ver Surg 2011; 40: 903-907. Zamos DT, Honnas CM, Herman JD, et al. Surgical repair of a fractured mandible in an adult camel (Camelus dromedarius). J Zoo Wildl Med 1992; 364-368. Kumar R, Singh G. Treatment of unilateral fracture of mandible by bone-plating in camels. Indian Vet J 1979; 56:58-59. Gahlot T, Chouhan D. Fractures in dromedary (Camelus dromedarius) – A retrospective study. J Camel Pract Res 1994; 1: 9-14. Auer J. Craniomaxillofacial disorders. In: Auer J, Stick J (Eds). Equine surgery. 3rd ed. USA: Saunders 2006; 1341-1362. Al-Dughaym AM, Ramadan RO, Mohamed GE, et al. Post-traumatic buccal infection and osteomyelitis with mandibular fractures in the dromedary camel. J Camel Pract Res 2003; 10:57-60.